The Altare della Patria (Altar of the Fatherland) is also known as Monumento Nazionale a Vittorio Emanuele II (National Monument to Victor Emmanuel II.) In fact, the slide is labeled the later. 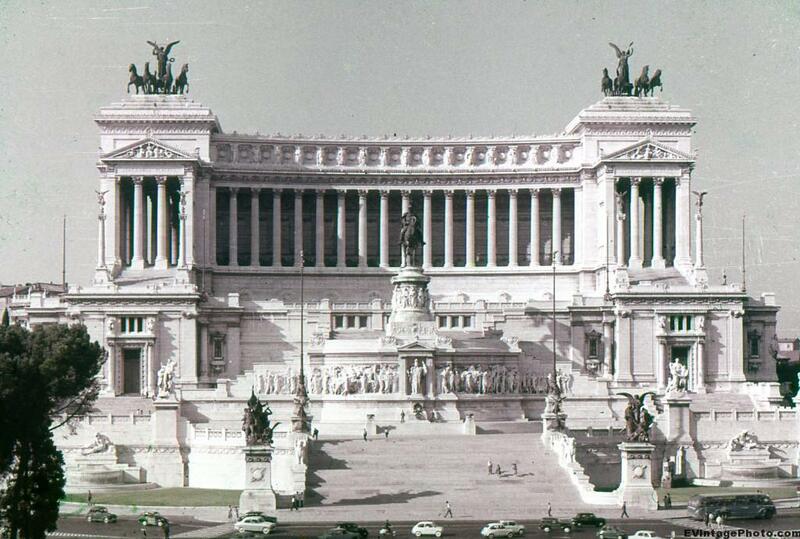 It was built to honor Victor Emmanuel II, the first king of united Italy. He was crowned King on March 17, 1861 and held the post until his death on January 9, 1878. The building was started in 1911 and completed in 1925. So at the time of this picture it would have only been 36 years old. Apparently the building is somewhat controversial. It’s construction destroyed a Medieval neighborhood, and the monument itself has more Greek influences then Roman influences in it’s architecture. Despite that, in recent years it’s apparently becoming one of Rome’s most visited landmarks. Unfortunately, this slide needed a lot of cleanup work in GIMP. There seems to be a bit of mold growing on it down in the corner. It also appears to have been photographed in black and white, but color restoration from the faded red typical in some brands of older slides restored some color to the grass around the monument and the bus seen in front. There are also a number of minute scratches in the slide as can be seen in the picture. None are bad enough to detract from the picture, in fact I think it lends a bit of authenticity to the slide.